DAYTON – Reporting child abuse or neglect is a responsibility we all share, but how many of us put thought and action into preventing child abuse? The Western Ohio Regional Prevention Council of the Ohio Children’s Trust Fund (OCTF) is releasing two brief videos to help raise awareness about how we can all do our part to prevent child abuse and neglect during April, which is Child Abuse Prevention Month, and throughout the year. Shot with a “video comic book” theme, the first video will be released through various Children Services websites and social media platforms on Monday, April 1. In a lively and colorful presentation, the video primarily features individuals who are directly involved in child welfare, as well as the Montgomery County Commissioners. The local celebrity video features area TV and radio personalities along with other well-known individuals from around the region. It will be released on April 10, which is Wear Blue Day in recognition of Child Abuse Prevention. Added details on the celebrity video will be released prior to April 10. The mission of OCTF is to prevent child abuse and neglect through investing in strong communities, healthy families and safe children. 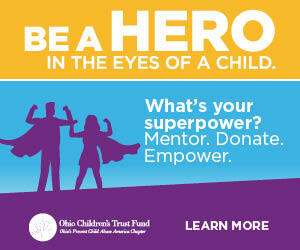 OCTF is Ohio’s sole, dedicated public funding source for child abuse and neglect prevention. Montgomery County Human Services Planning & Development is the Coordinating Entity for the 13 County Western Region, which includes Allen, Auglaize, Hardin, Mercer, Darke, Shelby, Logan, Miami, Champaign, Clark, Greene, Montgomery, and Preble counties. For more information about the Ohio Children’s Trust Fund, the Western Ohio Regional Prevention Council, and ways to engage in these efforts, please call 614-387-5478 or visit www.octf.ohio.gov.